This spacious chalet style apartment (43m²) is situated on the 8th floor with stunning panoramic views of the mountain and lake. Accommodation is made up of a double bedroom, bunk room, bathroom with shower & toilet, kitchen, large living room with a south facing balcony and a ski locker. This centrally heated apartment is very comfortable and can easily cater for up to 6 persons. There is a mezzanine double bed in the main bedroom, a bunk bed in the second bedroom and a double sofa bed in the living room. The apartment is new to the rental market and comes fully furnished to a very high standard with all equipment as new. The kitchen is fully equipped with electric hob, dishwasher, fridge, toaster, kettle, coffee maker with plenty of cutlery, crockery and glasses. Other features include a 26' flat screen TV, satellite TV channels, hair dryer, iron, ironing board. Clean bed linen and towels are included in the price. Situated within the desirable area of Val Claret. 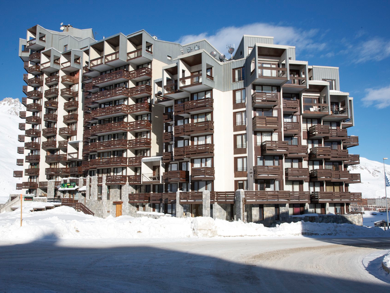 This chalet styled apartment is within easy reach (350 mtrs) of all the local amenities (see the Map of Val Claret) such as sheltered car parking, ski/snowboard hire, supermarket, restaurants, ski shops, apres ski and the ski lifts. More information about Tignes and our apartment can be found within this site. Should you have any questions or comments please feel free to contact us.